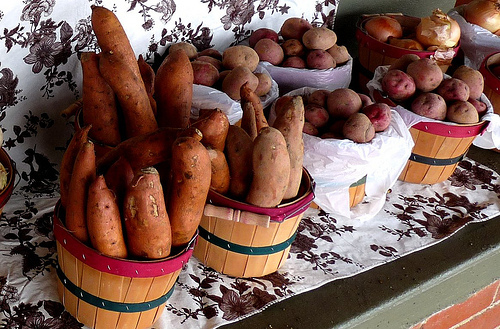 Sweet potatoes at the Farmers' Market. This will probably be my only Thanksgiving recipe post this year, but don't worry - it's a good one! 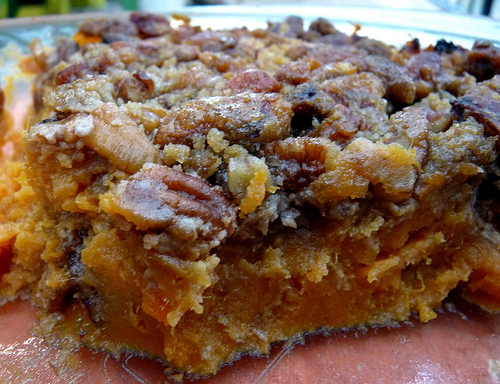 Years ago, Nathan's mom served a sweet potato casserole for Thanksgiving. I had never had this dish before, but after one bite I was sold - sweet and velvety, and topped with crunchy, nutty pecans. I asked her for the recipe and she sent it to me, at which point my heart sank. Her recipe wasn't even close to vegan, and used canned sweet potato. This was a travesty, but surely I could set things right. After hunting around, I found a very good recipe on Fat Free Vegan. As SusanV says, "This isn’t a fat-free recipe, though it does have less fat than other recipes of its kind," and that's fine with me. I made a number of changes to the ingredient list, but followed Susan's directions for preparing and baking. Therefore, my changes are listed below and you visit her (awesome, amazing and delicious) website to see how it comes together.